Courtesy of the kind folks at TOR Books and PR by the Book, I have an extra copy of Alex Bledsoe‘s recent release The Hum and the Shiver to give away to one lucky reader. Unfortunately, because of my limited shipping budget, I can only offer this to United States residents… But all you have to do is leave a comment below and I’ll contact the winner via e-mail on October 14, 2011! Check out the interview with Bledsoe and my review of the book to see if it might tickle your fancy. I think it’s one of the more creative, lyrical urban fantasies I’ve read in a while! Top Shot Season 2 Giveaway! That’s right – for one lucky winner, we have a totally new Top Shot prize pack! ENTER TO WIN A TOP SHOT PRIZE PACK FROM HISTORY! Top Shot, HISTORY’s hit competition series, is rearmed and reloaded. Sixteen fearless marksmen, carefully selected from thousands of applicants, will aim for the $100,000 prize package and the title of “Top Shot.” The all-new cast of 14 men and two women includes a 10-time NRA pistol champ, two former world shooting champs, a Texas cop, a Jersey shore Air Force sniper, a Bronze Star recipient, and representatives from four branches of the military. The 13-week series premieres Tuesday, February 8 at 10pm ET on HISTORY. Fans can check out exclusive content and play the Top Shot Reloaded Fantasy Game beginning February 7th on Facebook. Add a comment below with your thoughts on what gun changed the course of history and why. I will announce the winner on February 25, 2011, so be sure to have your comment posted by February 24, 2011! Author fitzPosted on February 8, 2011 February 27, 2011 Categories Contest, TelevisionTags DVD, Facebook, Gun, History, History Channel, Reality television, Recreation, Television, Texas, Top Shot!, Twitter27 Comments on Top Shot Season 2 Giveaway! Whenever something new from Aardman Animation comes along, my family takes notice. Our fascination began when we found the Wallace and Gromit shorts on DVD. Stop-motion animation lovingly done in clay is tough to beat and A Grand Day Out and The Wrong Trousers quickly gave way to The Curse of the Were-Rabbit and A Matter of Loaf and Death. Like the animation addicts we are, we even liked the computer animated feature they did with DreamWorks – Flushed Away. So when Shaun the Sheep left the comfy confines of Wallace and Gromit’s short film A Close Shave and started his own television series a few years ago, we were immediately fans as episodes began appearing on the Disney Channel in the United States. Slowly a great number of these episodes are finding their way onto DVD and we’ve been enjoying all of them! If you don’t know who Shaun is, he’s the leader of a flock of sheep on a farm. However, he’s not like normal sheep. He’s actually more like a human kid with creativity and a love for anything fun. As such, he gets himself (and his flock and friends) into quite a bit of trouble. Along with Shaun are many other fun characters like Shirley (the huge sheep who is a veritable eating machine), baby Timmy and Timmy’s Mother (easy to spot with the curlers in her hair), Bitzer (the farmer’s dog who tries to keep Shaun out of trouble), the Farmer (a clueless bloke who runs the farm but has no idea of what goes on), and the Pigs (who are always trying to get the sheep in trouble). Like Wallace and Gromit, Shaun and his friends are animated using stop-motion techniques in a moldable plastic. The sets and characters are all hand-created and every second of an episode is composed of 24 individual shots. If you’re counting, that amounts to more than 7,000 individual shots in a normal 5 minute episode. What’s amazing is that there’s no actual speech in any episode except for grumbling and the lyrics of the Shaun the Sheep theme song at the beginning. By removing the language element, I think it’s much more easily translated from country to country and culture to culture. The comedy uses classic slapstick visual gags and I have to admit I don’t mind the lack of words! The series has been garnering all kinds of awards lately as well, including an Honorable Mention in Audience Choice Award at the World of Comedy Film Festival (March 2010), the British Animation Award for Best Children’s TV Series, an International Emmy for Children and Young People (November 2010), the Children’s BAFTA for Best Animation (November 2010), and the Writer’s Guild Award for Best Children’s Television Comedy (November 2010). So we’re not alone in thinking Shaun the Sheet is a terrific series. We love that they’ve added a cat – Pidsley – to the mix in more recent episodes. He’s a vindictive little critter who gets himself and the rest of the farm into all kinds of trouble. In “Cheetah Cheater,” he watches a nature documentary about cheetahs on TV with the Farmer and decides he’d like to scare the flock a bit. He creates a cheetah suit out of one of the Farmer’s bathrobes and stalks the farm, scaring Shaun, Bitzer, and the rest of the farm. Eventually the flock catches onto his plan, but so does the Farmer – and he doesn’t appreciate the cat destroying his clothes! And in “Draw the Line,” a road line-painting machine is left nearby the farm and gets used in various odd ways. Initially, the Farmer uses it to draw the goalie box for a small game of soccer with Bitzer. Then Bitzer uses it to outline his doghouse and where his bowl and bone should go. But once Shaun and the flock get a hold of it, lines go everywhere around the farm as you might imagine. By the time the line painter gets his equipment back, the whole farm is in an uproar! In addition to the episodes, the DVD also includes a game where you can shear the sheep on screen and a couple of extras from the new preschool series Timmy Time. 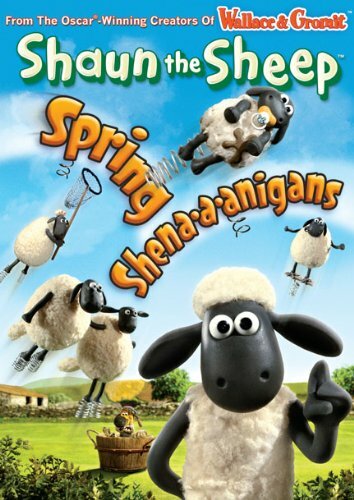 If you’re looking for some family fun, my family will back me up when I say we highly recommend you check out Shaun the Sheep: Spring Shenanigans on DVD! I have one extra copy of Shaun the Sheep: Spring Shenanigans for some lucky reader. If you’re a fan, all you have to do is leave me a comment on this entry and let me know you’re interested. The contest is open to U.S. residents only (sorry, cost of shipping is prohibitive internationally) and will end on February 18, 2011 – I’ll let the winner know by e-mail who’s getting the prize! p.s. Pick up this and other great Shaun the Sheep DVDs below!